If you answered yes, then you are experiencing wellbeing, a state of general contentment with life and the way things are. In this state we experience balance in body, mind, and spirit and feel connected to purpose, people, and community. The good news is that—with practice, we can enhance our wellbeing and achieve a state of balance and contentment. We can flourish! Listen to your body and mind. Notice what is going on. Take small steps. Investigate the results. Remember that wellbeing is our natural inclination. Trust your sense of what is right for you. 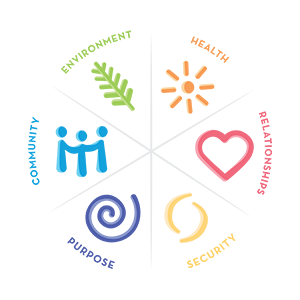 Our model of wellbeing was created by Dr. Mary Jo Kreitzer, Director of the Center for Spirituality & Healing at the University of Minnesota. In her extensive work and research around integrative health and healing, Dr. Kreitzer identified six dimensions that contribute to wellbeing: health, relationships, security, purpose, community, and environment. We invite you to explore each dimension. Our hope is that this model will lead us to individual, community, and environmental wellbeing. To begin, assess your overall wellbeing.